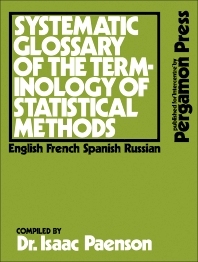 Systematic Glossary of the Terminology of Statistical Methods focuses on the elaboration of terms used in statistical methods. The publication first elaborates on the subject and basic methods of statistics, collection of statistical data, and classification and tabulation of statistical data. Discussions focus on the basic methods of statistics, units used in statistics, statistical inquiry, and the subject of statistics. The text then ponders on graphic presentation, averages, and measurements of variation. The manuscript examines essential theoretical distributions, moments of a frequency distribution, and statistical inference. Topics include point and interval estimations, binomial and normal distributions, nature of theoretical distributions, and elements of the theory of probability. The text also evaluates the theory of attributes, correlation, analysis of variance, and time series, including decomposition of time series, multiple correlation, and variance analysis with two or more principles of classification. The publication is a valuable reference for readers interested in the terms used in statistical methods. (partial) The subject and the basic methods of statistics. Collection of statistical data. The classification and tabulation of statistical data. Graphic presentation. Averages. Measures of variation. Some important theoretical distributions.The moments of a frequency distribution. Statistical inference. Tests of hypotheses. Theory of attributes. Correlation. The analysis of variance. Variance analysis and correlation. Time series. Time-series: Seasonal fluctuations. Time-series: Cyclical fluctuations. Index-numbers of prices. Indexes of production and productivity. Sampling surveys.